The Northern bat is medium-sized (240-280 mm wingspan) and characterized by its shaggy dark brown fur with yellow tips. Its ears are round and dark as its skin. E. nilssonii is common in northern Europe and can also be found beyond the Artic Circle. If favours habitats such as agricultural areas and woodlands. Summer roosts include crevices in buildings, while in winter E. nilssonii hibernates in houses, cellars and sometimes mines. This species forages in open areas and around streetlamps, where large insect swarms tend to gather. By undertaking rapid dives, the Northern bat is able catch small Diptera, beetles and other insects. Although it appears to be a sedentary species, ring recoveries have shown that occasionally long distances (100-450 km) have been undertaken. This species is widespread and occurs from France and Norway through much of northern and central Europe. 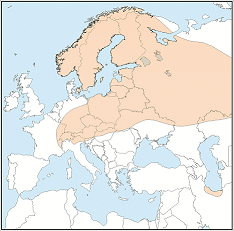 This is the only bat species to occur above the Artic Circle (70°N). Its range extends to Siberia, northwest China and it has been seen in Iraq, Iran and Mongolia. There are no major threats.